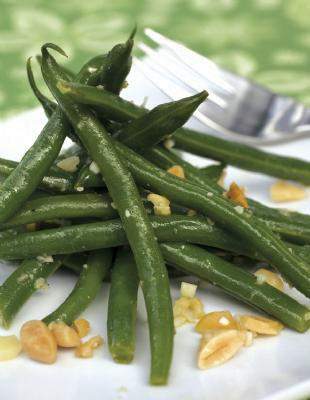 The Spanish nuts in the Green Bean Salad with Marcona Almonds help make this summer side dish shine. Green bean salads generally are bit players on the summer food scene. But a few carefully chosen ingredients can transform them into scene stealers that let one of the season's best offerings shine. In this salad, the beans are briefly blanched and chilled, leaving them just tender-crisp. They then are tossed with a spunky vinaigrette of olive oil, sherry or red wine vinegar and a healthy dose of garlic. Crumbled cheese and crushed almonds finish the dish, but variety is key. For the cheese, you want something dry, crumbly and either sharp or deeply savory. A parmesan works, as does a well-aged cheddar. For the almonds, the best choice are Marcona almonds, which come from Spain. These flat, round almonds (widely available at gourmet and natural foods stores) are sweet and savory, and usually are sold roasted and salted. Marcona almonds taste nothing like American almonds. While they are crunchy, they aren't dry. The oil and salt on them blends nicely with the vinaigrette.